What are the Eyebots, and what can they do? James developed the Eyebots while completing his doctoral thesis in the Laboratory of Intelligent Systems, EPFL Switzerland. The Eyebots are part of the highly successful international “Swarmanoid”, Future Emerging Technologies project, funded by the European Commission. Eyebots are autonomous flying robots with powerful sensing and communication abilities for search, monitoring and path-finding within built environments. They operate together in a swarm, to efficiently explore built environments, locate predefined targets, and guide other robots or humans. This video shows a close-up of all the cool features that were packed into the Eyebots. Including; carbon fiber structure, magnetic ceiling attachment mechanism, various control boards – with a speech synthesizer ;o), inertial sensors, HD video camera with a laser pointing device, embedded Linux computer, custom infrared based 3D relative positioning sensor ring with collision avoidance, and four powerful coaxial brush-less motors. What is the Swarmanoid Project? 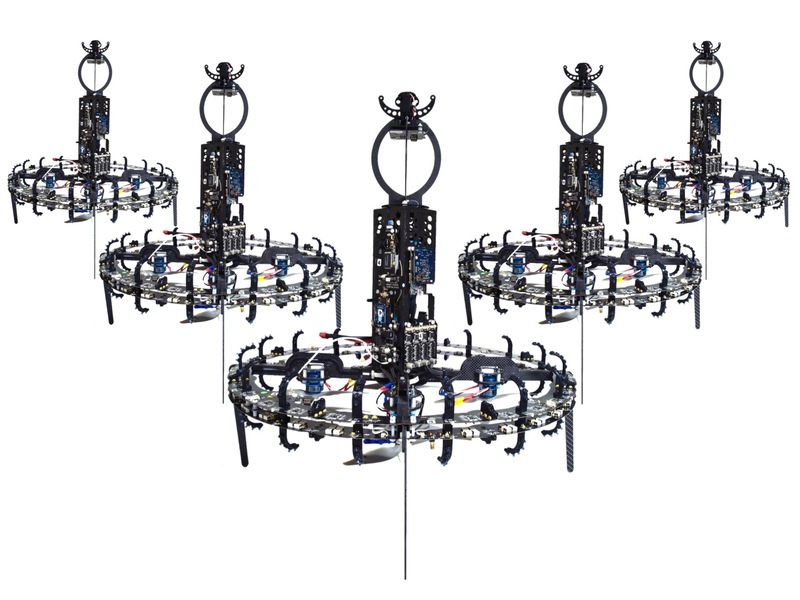 Eyebots are part of the Swarmanoid, a European research project aimed at developing a heterogeneous swarm of wheeled, climbing, and flying robots that can carry out tasks normally assigned to humanoid robots. 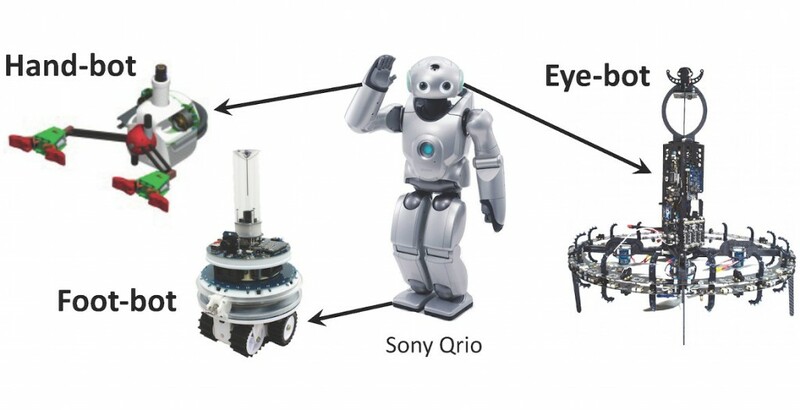 Eyebots serve the role of the eyes within the Swarmanoid and guide other robots that have simpler sensing abilities. Eyebots can also be deployed on their own within built environments to locate humans who may need help, suspicious objects, or traces of dangerous chemicals. Their programmability, combined with swarm intelligence behaviours, makes them rapidly adaptable to several types of situations that may pose a danger for humans. The Swarmanoid is like a humanoid robot broken down into its most important parts, Eyebots, Footbots and Handbots. This is a video that all the Swarmanoid partners put together. It describes the entire project and the goal of using a swarm of heterogeneous robots to search an unknown environment and collect an object of interest (in this case a book on a shelf). This task may be trivial for you and me, however trying to do this with a robot is very difficult. It is even more complex with a swarm of robots. The idea of using a swarm of robots instead of a single humanoid robot allows for multiple robot failures before the task can no longer be achieved. Take a look at the video. What is a 3D relative Positioning Sensor? Relative positioning sensors constitute the holy grail of collective robotics. They allow multiple robots to cooperate and work together in a team to achieve a common goal. Relative positioning sensors use simple, local sensing and communication in the form of distances and angles between neighbouring robots. This simple local sensing and communication minimises the embedded computational requirements, as the relative position information is directly attained. By having at least one flying robot stationary, used as a static reference point, several flying robots can use relative positioning information to achieve position control, mitigate platform-drift, enable goal-directed flight and achieve collective operation. Such an approach could be used in most situations, as it does not rely on feature extraction in the surrounding environment like SLAM based (laser scanner and vision) approaches and is computationally simple. 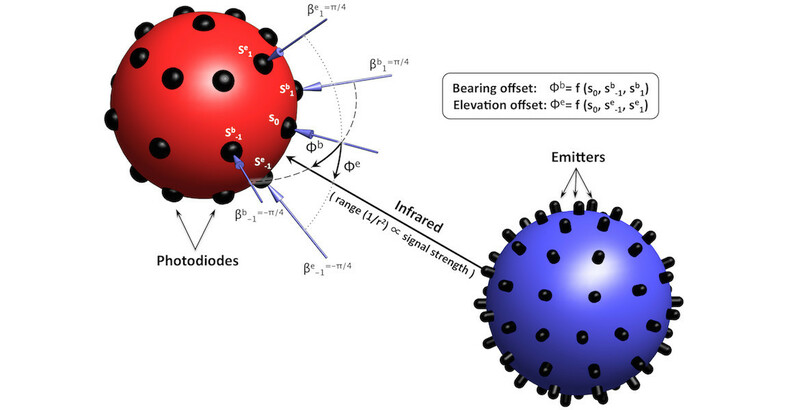 This diagram explains how the Eyebots sensors can detect the range, bearing and elevation between multiple flying Eyebots. What is the PhD. Thesis about? The goal was to develop a practical methodology for enabling energy efficient, autonomous indoor flying robots capable of inter-robot spatial-coordination for unprepared indoor environments, without using external aids. In order to achieve this several practical methodologies have been proposed and demonstrated. The developed methodologies has enabled the collective operation of indoor flying robots, without using external aids. Eyebots are autonomous indoor flying robots capable of inter-robot spatial-coordination. James is one of the pioneers for autonomous quad-rotor technology. The videos below show various results from topics that are referenced within the thesis, under the corresponding chapters. This is a video of a custom built quad-rotor made entirely from Printed Circuit Board (FR4), with the electronics embedded directly into the frame. It uses an ultrasonic sensor to automatically take-off and fly at a constant height off the ground. To track the robots trajectory, this low resolution video it is taken from above with a fish-eye lens and then later post-processed in MATLAB. The robot is a custom built quad-rotor made entirely from Printed Circuit Board (FR4), with the electronics embedded directly into the frame. It uses four infrared sharp distance sensors (spaced at 90 degrees) and one ultrasonic sensor for altitude, to fly autonomously within a room, with an obstacle avoidance behavior. This is the same setup as above but the embedded controller is coded for an anti-drift behavior. This video shows a custom built quad-rotor that uses one ultrasonic sensor for altitude controlled ceiling attachment. X and Y positioning is done by manual remote control. A hall-effect sensor determines when the robot is attached and powers down the rotors. The system can also detach automatically and recover to a pre-defined altitude. The system uses a magnet to attach to ferrous ceilings as a proof of concept. This video shows how the Eyebots 3D relative positioning sensors were calibrated. There are 48 infrared receiver photo-diodes and 160 infrared emitters per sensor ring. One ring was used in transmitting mode (on the wheeled robot) and the other ring (under calibration on the ABB) was used in receiving mode. The infrared 3D relative positioning sensor was calibrated using an ABB robotic arm and a wheeled robot, which drives along a track. High accuracy signal strength measurements, for all 48 photodiodes (spaced in 3D around the ring), were taken at 10cm increments up until 6m. This is later used in a look-up table to estimate the range, bearing and elevation between any two Eyebots. This video shows how the Eyebots 3D relative positioning senors were characterised. There are 48 infrared receiver photo-diodes and 160 infrared emitters per sensor ring. One ring was used in transmitting mode and the other ring (under test) was used in receiving mode. Three lasers were used to align the distance and the bearing and elevation angles. The transmitting sensor is continuously rotated by a motor to obtain a full intensity range infrared pattern variation within the results. The receiving ring is then moved through a 1m x 1m grid to obtain the characterisation data. This is done to determine the 3D sensors range, bearing and elevation performance. This is a simulation video that was coded by Dr Timothy Stirling. It shows the basic navigation and search algorithm that is used in the Swarmanoid Scenario demonstration. The sensor network algorithm is based on systematic incremental deployment/re-deployment, and a sweep search. Blue beacons guide green flying explorers. The hop-count gradients guide the deployment. Green hops are used in corridors and red are used in rooms. The hops safely control the detachment. Systematic, incremental deployment is energy efficient. Beacons guide robots and humans at the base to the located target. In this demo, there are two Eyebots, one flying and one placed on the shelf at the end of the room. The flying Eye-bot controller is coded to stay at a fixed position in the middle of the room. The infrared proximity sensors are then used to prevent the Eye-bot from crashing into the walls. The proximity sensors are non-linear so it behaves a bit like an invisible cushion that pushes away from obstacles. As it is using the amplitude of the infrared reflection, the larger and more reflective the obstacle is the better it can detect it (hence the limited response from my hand). The system relies solely on an on-board infrared 3D relative positioning sensor (the ring around the bottom) to determine its position in 3D space, with respect to other Eyebots. It is also capable of proximity sensing in order to avoid obstacles (e.g walls, people) up to a few meters away. In this demo, there are two Eyebots, one flying and one placed on the floor at the end of the room. The flying Eye-bot controller is coded to cycle between two way-points a few meters apart, it basically flies between the two way-points until the batteries are flat. In this demo, there are three Eyebots, one flying, one placed on the floor at the end of the room and one attached to the ceiling. The flying Eye-bot is commanded to fly along the chain of robots and attach to the ceiling at the end of the room. The stationary Eyebots are used as 3D reference points. In this demo, there are seven Eyebots searching a building for a desired object. The stationary Eyebots are used as 3D reference points to guide the 3D path of the Flying Eye-bot. One Eye-bot is deployed at a time to search the building. Once each Eye-bot reaches the limit of its 3D sensor range, it attaches to the ceiling. Each Eye-bot does the same to extend the search chain further into the unknown environment. The search continues until the object has been found using their on-board camera (in this case a book on the shelf). The Eyebots then communicate back down the chain to stop more Eyebots being deployed. This is an induction based contact-less distance scanner designed for a quad-rotor. It uses two rotating sharp infrared sensors. Power is transferred between two coils, one secondary coil attached to the rotating part and another primary coil attached to the base. A H-bridge is used to drive the primary coil. Data is transferred through an NFR wireless transceiver. A simple PD controller is used to balance the distances in all directions to push the quad-rotor away from obstacles.